She stands facing a ferocious wind. It's minus 2 degrees, and she's naked. Indifferent to the cold, she dives into the freezing waters of the sub-Antarctic, a thin layer of seal grease applied to her skin serves as insulation. A sea-nomad, she canoes from island to island hunting with her kin, living off the rich fat of marine mammals. Her stature is short but her barrel-shaped rib cage is large, evolved for a greater oxygen transfer. Her organs have adapted to her high-fat diet, and her metabolic rate is high, so much so, that her body temperature runs a full degree warmer than yours. She rests in a deep squat to conserve heat and lights small fires that burn into the night. Her people have lived and thrived here against the harshness of the environment at the End of the Earth for 10,000 years. She is of the Yámana Tribe, the Southern most people in the world and the frigid, windswept ‘Land of Fire’ is her home. Fast forward 150 odd years, and it is also my destination. After hours of travel, I arrive in Tierra del Fuego, an island at the end of Patagonia shared by Chile and Argentina. Rugged, raw and wild it is often overlooked as merely the gateway to Antarctica. I’m here to find out whether it should be on your bucket list as a destination in its own right. The sky is on fire. The sunrise colours are so vivid I want to bottle them as they burst across the fjord. No camera, regardless of how fancy, does it justice. We scuttle for them regardless, desperate to capture and consume the moment before it overexposes with the emerging day. Weirdly, it doesn't. So far south the dawn lingers, and the sun saunters around the horizon making every hour ‘magic hour’. The air filling my lungs is some of the purest in the world but the cold squeezes down around my bones, and I bounce from one foot to another in a fruitless bid to keep warm. I assumed it was these blazing skies that burn at dawn and dusk that gave Tierra del Fuego “Land of Fire" its name. In fact, this moody archipelago was named when Magellan sailed through these inky Straits and saw the same fires of the indigenous Fuegians – the Yámana and Selk’nam tribes. Explorers Darwin, Drake, Cook and Weddell were all left with lasting impressions of these local people who seemed immune to the extremely hostile, unbroken environment that was their home. Sadly, instead of remaining in awe of the indigenous ability to thrive here, to respect their ways and to even learn from them, the story of colonial history once again repeated itself. European colonials arrived in the second half of the 19th century and disease, particularly measles, ran rampant killing many. Locals were disregarded as ‘uncivilised’ and without understanding the British concept of “land ownership,” they were killed for hunting where they always had, mistaking the newly arrived herds of sheep as fair game, which led to a systematic genocide. Head-hunters were paid to bring in the heads of indigenous people, with bonuses for pregnant women. Their decapitated craniums were even shipped off to museums in Europe. Even the well-meaning missionaries who tried to clothe them inadvertently killed them. Living an exclusively outdoor life in wet, cold Tierra del Fuego meant that heavy clothing didn’t dry, it just made the wearer colder. The Yámana would constantly tend fires, even keeping them burning in their canoes to dry and warm their bare skin quickly. Introducing unfamiliar, damp clothing, they contracted pneumonia wearing the foreign clothing that didn't suit their seafaring ways. Today, it is rumored that there is only one full-blooded Yámana alive who speaks the language. The last full bloodied Selk’nam died in 1974. 10,000 years of history obliterated in a few generations, yet their legacy continues. The customs and culture are proudly shared with us wherever we go. I’m fascinated but also humbled by this unique landscape. I wonder how anyone could survive these gale force winds, the barren pampa, the fierce oceans, sleeping uncovered and unprotected against vast starry skies? I happily and gratefully return to our rustic, warm lodges at days end and think of the original Fuegians. 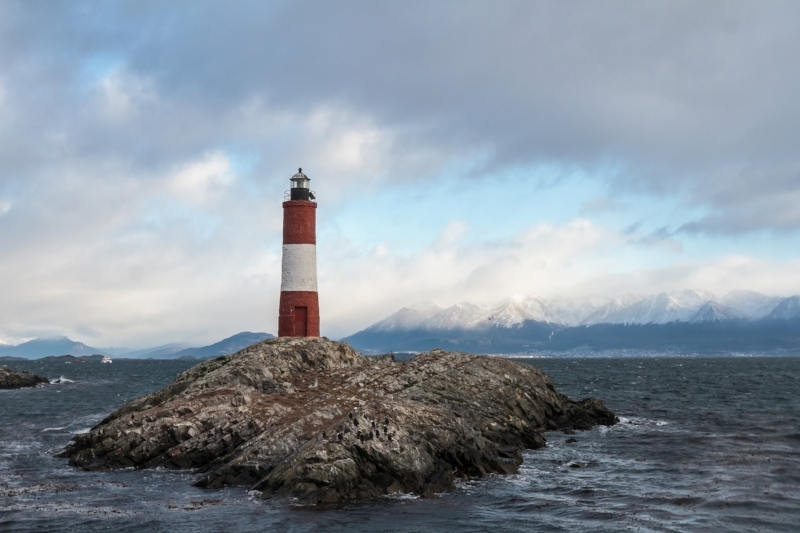 The best approach to Tierra del Fuego is to understand it as two sides of the same coin, best explored from both faces. In Argentina, you will find a more urbanised tourism trade, a greater number, and range of hotels, outfitters and formalised activities. Whereas on the Chilean side you can expect to completely detach from modern madness amongst towering mountains and stand in sheer isolation on tundras with not a single building in sight for hundreds of kilometres. When the mighty landscapes crush down upon you, ‘Findel Mundo’ meaning ‘End of the World,’ makes sense. We began our journey in Argentina, flying into Ushuaia. The following days we spent navigating the Beagle Channel spotting for whales and marveling at the thick confetti of birds that patrol the skies. We observed a penguin colony and hiked across an untouched islet discovering tiny berries that only fruit in the purest air. Back on the main island we drove kitted out Land Rovers to the craggy seaside to climb a remote outcrop, the summit marked by a desolate, broken lighthouse razed to the ground in an earthquake. Even the burliest structures are no match for the whims of Mother Nature out here. We meandered along the desolate coast stopping to explore a shipwreck. These seas are the roughest in the world. However, on closer inspection, they are not as rough as human greed. The bags of concrete lining the skeleton hull and a hefty insurance payout is what felled this mighty vessel, which lies broadsided, naked and rusting in the frigid air, now a funky tourist site. With a fresh blanket of pure white snow, we explore the island; rip-roaring along wild 4x4 trails, breaking through the new powder, which squeaks in protest beneath the snow tyres. The fresh winter dump has brought down numerous trees, and we winch them from the remote tracks, hollering with joy. Parked deep in the silent forest, we hop out and spontaneously break out into an epic snowball fight, our laughter peeling away through the trees. It’s a perfect moment, which sums up our childlike wonder in this place. Everyone thought I was mad to come this far south in the middle of winter, but arguably it's a good time to come. Cold yes, but bright and thick with the promise of winter adventure and competitive off-peak pricing. While the days are short, the threat of rain is minimised, and we simply don't let the lack of daylight stop us. In the evenings we snowshoe to remote cabins, our path illuminated by the soft circles of light cast by our headlamps. We indulge in delicious meals of scrumptious meat washed down with endless bottles of incredible local wine. We explore and play and fill our adventurous souls to the brim. On our final day on the Argentinean side of Tierra del Fuego, we take to the skies. The blades of R44 helicopters beat and cut the air above the port of Ushuaia, carrying us higher into the mountains before depositing us atop the mighty summit of Le Cloche, which offers the best few of Mt. Olivia. So great is our awe that we can't fight the urge to drop to our knees at the moment. Do you remember the last time you felt like that? So floored by the beauty that you can't stand up? We are handed glasses of champagne and toast the sunset and Argentina for its incredible show. So much for thinking this is just the gateway to Antarctica. What a treasonous thought. Boarding a tiny twin otter plane we are warned by the pilots that any loud noises shouldn't concern us, it's just ice being blended in the turbine engines, and we should expect some relatively strong turbulence. That's normal down this way apparently. True to their word we bounce our way over the mighty Darwin range in what feels like a ‘tuk-tuk’ plane, transferring to the Chilean side for the second half of our adventure. I have to be honest, at this point, I wasn’t sure how Chile would measure up, let alone match what we’d just experienced in Argentina. We disembark at an outpost called Provenir, followed by a long car ride and about six hours later, we find ourselves in the middle of nowhere. If ‘Whoop Whoop' were to exist anywhere, this would be it. Apart from the odd fence, there is nothing. Not even a tree. Just low-lying grassland, the aggressive wind whipping any sign of fertility back into the cold, barren earth, the horizon occasionally broken by the silhouette of a guanaco (a native lama like creature). After the rush of Argentina, I begin to question what the attraction of this side of Tierra del Fuego is? After a few more hours passing through this never changing landscape, I’m feeling frustrated, to say the least. Nature is in balance. The endless landscapes under vast skies, the craggy unclimbed peaks, the abundance of fish in clean rivers (side note - this is a secret fly fishing paradise - if anyone asks I didn’t let the cat out of the bag). At first glance, you may see nothing, but upon deeper reflection, you see everything, the world, as it should be. The tundra eventually gives way to lichen draped forests that grow beyond the reach of that fierce wind. It's almost as if the wind finally gave up and relented, an invisible line where it allowed things to stand up again, even the earth begins to rise into foothills, and beyond those, the steep snow-capped mountains of the Darwin Range. We climb to the top of Cerro Pietro Grande (which in my atrocious Spanish, I believe translates to Peter’s Big Hill). Up through the Lengas, Centennial Nirres and other sub-antarctic trees of the Karukinka Park, we arrive at the top to a stupendous 360-degree view. With the aridity of the plains on one side and the majestic mountains on the other and not a single sign of human interference evident, this is what we have all been seeking. Nature - pure uninterrupted nature. 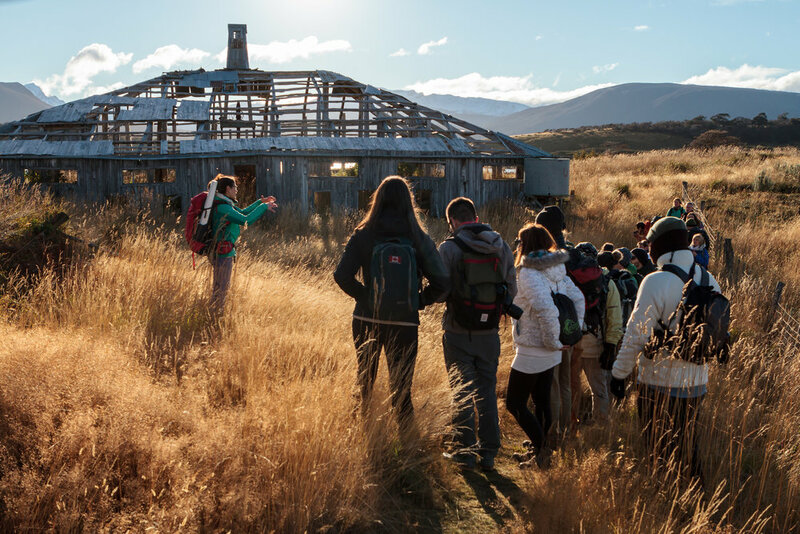 It’s not as much a “Things to Do” list that you’ll find on the Chilean side of Tierra del Fuego, it’s more the wilderness in its own right and the sense of wonder and freedom that disconnection brings. Something that can’t be tamed, bottled and sold in a catalogue. I feel silly at how myopic I'd been wondering why the guest house existed. It's symptomatic of our addiction to always need entertainment, activities and Instagram-worthy experiences. 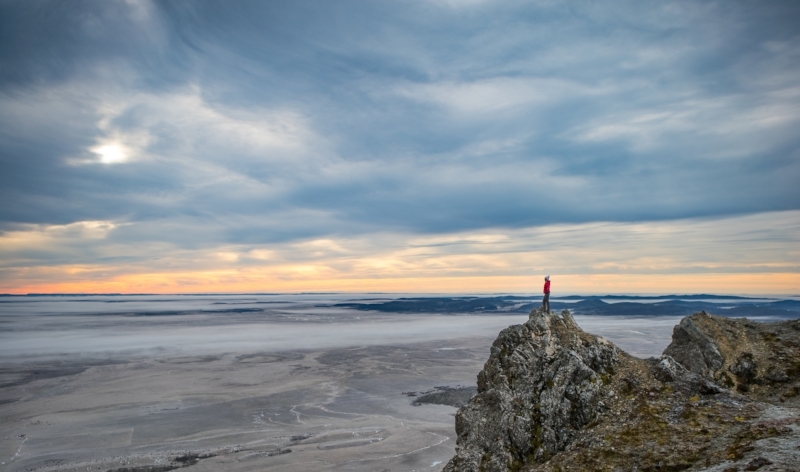 We struggle to be present in the moment, tiny in nature and find that fulfilling enough. Crossing the mountain pass, we arrive at a tiny, isolated bay for the final leg of our adventure – navigating the fjords and glacier- gazing aboard a true expedition ship, the ‘Forrest’. Picture a cruise ship and now imagine the opposite. Small, kitted out and tough as nails. It’s our home for the next few days. To get to her, the salty crew haul us aboard like navy-seal-esque Zodiacs, the waves slapping us with freezing water as we go. Aboard, we cruise the fjords, gorging ourselves on more food with wine, always wine and feel like real explorers. We don't see another tour group in days, just the occasional fishing vessel hunting for King Crab. Sightings of whales, leopard seals and sea lions become so commonplace that we no longer react in a frenzy for our cameras. We observe and are observed and sail on. We spend the morning kayaking the frosty waters, careful not to fall, while we chase pods of dolphins. They seem to poke fun by breaching right beside our boats, setting us off on a power chase only to resurface again in the opposite direction. Nature wins, and it's a beautiful thing. I think that fundamentally this is the risk here. Nature needs to win. There are so few places left in the world that have this level of untamed wilderness. Each day they are being conquered and destroyed. 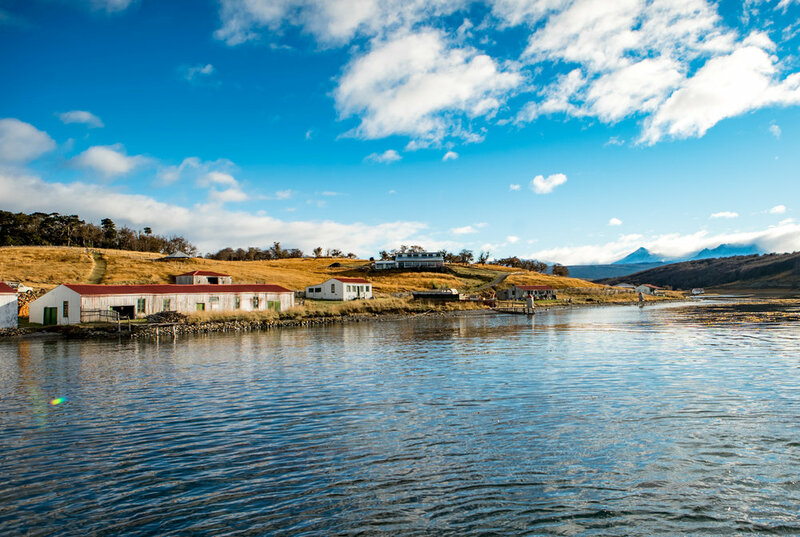 While Tierra Del Fuego should be on your bucket list, this lesser known corner of the globe is in danger from our flimsy demands and desires as tourists. It could so easily be overdeveloped and overrun. Its natural resources, stillness and abundant nothingness quashed and pruned to fit into the mould of digestible tourism. So if you come here, which I advise you to do, please be the responsible, conscious traveller that is happy to rough it a little and explain to the local industry along the way, that the wild is what you’ve come for. Stand modest in nature, quiet, unplugged and balanced. Seek that with your powerful dollar and forget about a need for constant wifi, entertainment, creature comforts and uniform luxury hotel chains. Tierra del Fuego is resting on a tipping point. Arguably it’s in one of the most precarious of its time. Will it remain as it is or will it perish beneath concrete roads laid for tourist coaches? It’s like the indigenous that died of pneumonia; the desperation to develop it could kill it with misguided kindness. Let's help them keep it the way it should be, like the wild, untamed isolation you imagine when you think of the ‘End of the World’ because that is how it currently stands. Caroline is a television presenter, producer, adventure addict and once upon a time Miss Australia. Winning a beauty pageant was seriously unexpected for this adventure girl who fell into the competition through charity. Growing up with two brothers and always outside, she found herself more comfortable in a pair of muddy boots than wearing a tiara, so she quickly hung up the high heels, quit the catwalk and broke a new trail. Now dubbed MissAdventure, she now spends much of her life either in front or behind the camera creating travel, adventure and action sports media and programming.